Lion Dance slot is a 40-line game of 5 reels and 4 rows from Red Tiger Gaming. This Isle Of Man based developer is becoming more prolific as their crisp and bright feature-packed games are incorporated into more and more multi-platform online casinos. Many of their slots tend to have Oriental themes and here we have the colourful procession Lion at the centre of the game alongside festival adornments like drums, lanterns and ribboned cymbals on white reels over a festival square image. If you are familiar with Red Tiger slots, you will be aware most have several random in-play features added - and you won't be disappointed here! The icons on Lion Dance appear stacked in various quantities from 1 to 4 and the festival Lion itself form the games Wild which appears on all reels and can be stacked. There is no multiplier but it does share the title of highest-paying icon along with the Drum at 888 coins (44.4x stake) as you only need to bet 20 coins for the 40 lines. The cymbals pay 9.4x and lanterns 6.9x down to the lowest of the card symbols, the 10 which pays 0.9x stake. The odd amounts are because like many slots nowadays the pays end in an 8 as this is considered a lucky number in China! Connected Tiles Feature - one of the best 4 symbols (which includes the Wild) is highlighted and then can spread to an adjacent tile and so-on until hopefully it has covered several positions over all reels. Win is then paid. Mystery Symbol World - several gold coins appear over the reels and will flip to reveal an identical symbol beneath all of them. 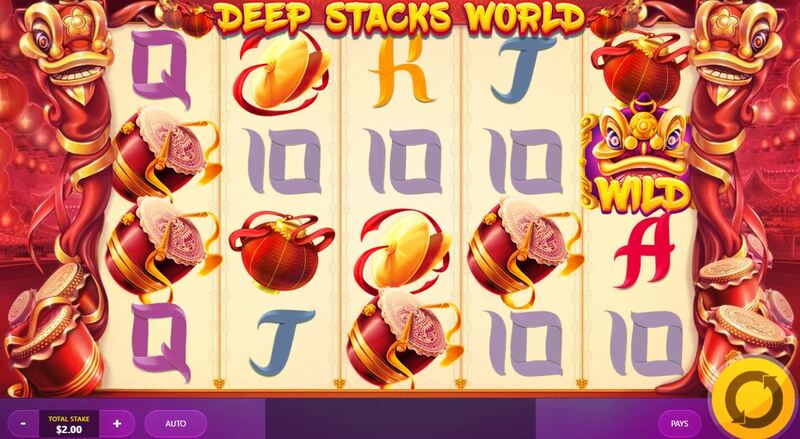 Deep Stacks - the top 3 picture icons go through a spectacular display as more and more stacks are added to the reels in place of the card icons. If you are fortunate 3 or more consecutive reels will line up and a handsome win is yours! Mega Tiles - where the top-paying symbols including the Wild can appear on the reels in 2x2, 3x3 or even a huge 4x4 block. The reels stop and if you dare dream you'll hit a 4x4 Wild over the reels! You stay in these various Worlds until the festival Lion appears again to change them. On any spin you may get a random enhanced play where the appropriate feature for that World is awarded. 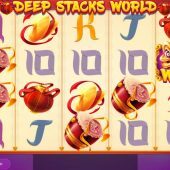 There are bunches of red firecrackers on reels 1, 3 and 5 and these are the icons you need to trigger 8 to 18 free spins (yes, it's that '8' again). You will enjoy these games though as on each spin you are guaranteed one of the above enhanced spins to occur, from any of the Worlds.